Zhou Qiang was re-elected as governor of Hunan Province and Zhang Chunxian as provincial top legislator on Thursday at a session of the provincial legislature. Wang Chen, former publisher of People's Daily - a leading newspaper of China - has been appointed minister of the Information Office of the State Council. 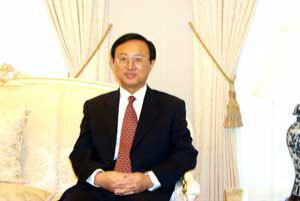 China's national legislature on Thursday removed Finance Minister Jin Renqing from office and appointed his replacement. The Central Committee of the Communist Party of China (CPC) Monday announced the latest reshuffling of the provincial leadership after the 11th National People's Congress (NPC) elected a new State leadership lineup last month.